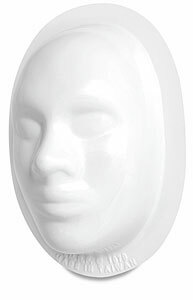 Made of sturdy plastic, this face form is just the beginning for your creativity to build upon. Use it as a base over which to apply plaster cloth or papier mâché, then remove it. Or, use it as a mold for clay or plaster. Inside dimensions are 7½" × 5" (19 cm × 13 cm). Outside dimensions are 9" × 6½" (23 cm × 17 cm).